On April 16, 2011, I had the pleasure of providing musical entertainment for Tiffany and Jae's wedding reception held at the Valley Regency in Clifton, NJ. 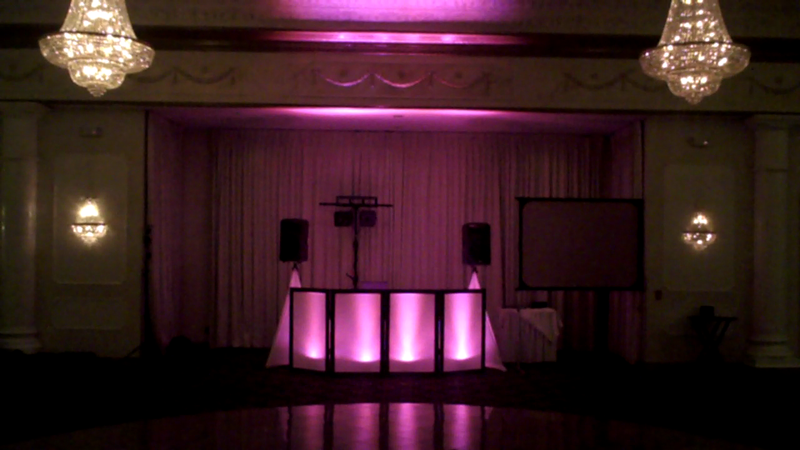 The couple, both professionals based out of New York City, originally found Ambient DJ via WeddingWire. Mother Nature was in a foul mood on this particular day, delivering abundant amounts of rain and cool temperatures. Accordingly, the onsite ceremony at the Valley Regency was moved indoors. The florists (Designs by Ahn) decorated the ceremony room beautifully with fragrant cherry blossoms, complementing the cherry blossom trees in bloom visible through the windows. Prelude music included songs entirely by the Vitamin String Quartet (VSQ) who cover pop and rock classics in a classical strings configuration. The parents of the bride and groom were seated to "You're Beautiful" (by the VSQ), followed by the bridal party entering to VSQ's version of "Love Story." 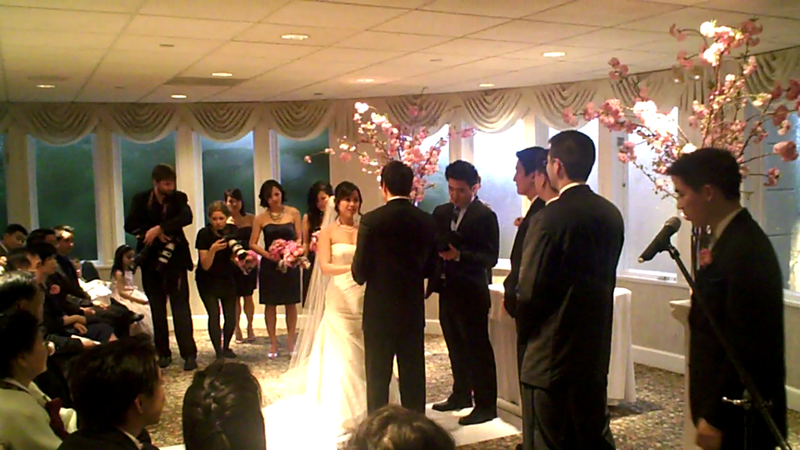 Tiffany was then walked down the aisle by her father to VSQ's version of "Yellow" by Coldplay. Pastor Abe Cho gave a very articulate and meaningful sermon. Perhaps the most moving part of the ceremony came when Tiffany and Jae honored their parents with remarks that they had prepared, but that were read by family members. Meanwhile, I played very softly an instrumental version of Josh Groban's "The Prayer." After taking their vows, the couple exited to the original version of U2's "Beautiful Day." Cocktail hour followed in a separate room, with a delicious "Viennese-Style" smorgasbord! 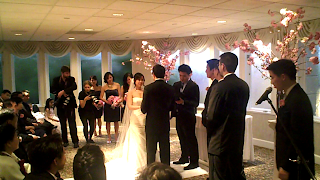 During cocktail hour, Tiffany and Jae enjoyed a traditional Korean ceremony known as "Paebaek" as shown below. 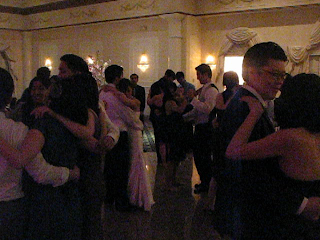 The reception was held in the Valley Regency's majestic ballroom. Guests enjoyed an evening of fine dining and dancing, with the formal part of the program emceed by the bride's brother, Mr. Eric Lau. Despite an ambitious program that included numerous wardrobe changes for the bride, events flowed smoothly. Special touches included a video slideshow and a special flambe jubilee presentation provided by the staff of the Valley Regency. Another special touch was a "kissing game" - when guests tapped their glasses for the bride and groom to kiss, the Emcee would "randomly" select a couple to come to the dance floor and kiss - they would then be followed by the bride and groom who had to follow the first couple's kiss choreography. This twist on the traditional glass tapping ceremony made things interactive and fun! Open dancing kicked into high gear for the final hour, with guests dancing to a mix of modern dance music interspersed with ballads and rock n' roll classics. A particularly vigorous reaction from the ladies resulted after the dedication of Justin Bieber's "Baby" - apparently Bieber fever is in season. For the final song of the evening, guests gathered arm-in-arm in big circles with their friends and family, cherishing the moment. A big shout-out to Michael Gross at Michael Gross Photography who captured the many special moments! Memories are Made of This !